The seven suburi are an integral part of our style of aikido. This little document is an attempt to get the beginner's arms and legs moving in roughly the correct form, and as a reminder for those times when memory fails. It is in no way definitive, and any real detail must come from personal instruction. Begin by standing in right hanmi. The bokken is held by placing the left hand at the bottom of the hilt with the little finger almost falling off the very end of the hilt. The grip is primarily between the thumb, ring finger and little finger, and is applied with a wringing motion, keeping the arm relaxed. The knuckle of the left hand index finger of the should be halfway between the top and the side of the weapon. The middle and index fingers should be relaxed and tucked under the bokken. The right hand should be one fist's width above the left hand and it should mirror the left hand grip in all respects. It is important to grip with a wringing motion and to keep the arms and shoulders as relaxed as possible. 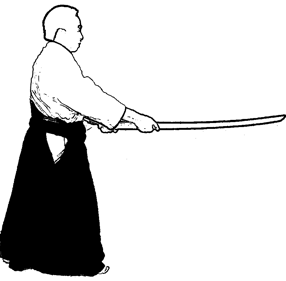 The bokken should be held out in front of the tanden or center with a feeling of extension. The orientation of the blade is rotated slightly clockwise from the vertical. All of these exercises start from right hanmi with the bokken held as described above. This will be referred to as a basic ready position. The first suburi is a basic shomen cut From the ready position, raise the sword so that your left hand is on your forehead and the sword is angled slightly back. During this movement your hips should turn from a triangular orientation to a square one. Cut down and out with a wringing motion, as if you were flinging something off the tip of the bokken, and let your hips return to their triangular position. Finish with the sword in front of your center. The tip should be just slightly lower than the hilt, though you should not allow your wrists to flex up in order to accomplish this. At all times keep the sword within the plane of your centerline. Always cut with a relaxed motion. From the ready position, step back deeply with the right foot and raise the sword so that the left hand is just above the left eye. This position is known as hasso kamae. Step forward with the right foot and perform a shomen cut. This suburi starts the same as number 2, except the sword raise continues over head in a circular motion until the sword is almost resting on the right hip. This position is known as waki kamae. Step forward with the right foot and perform a shomen cut, making sure the sword comes directly down the center line. From the ready position raise the sword as you bring the right foot back to the left foot. The sword should be directly overhead and your feet should be together. Step forward with the left foot and perform a shomen cut. Now raise the sword as you bring the left foot back to the right foot. Step forward with the right foot and perform a shomen cut. Continue this process while alternating feet. Do a shomen strike as in number 1. Rotate the blade clockwise until the edge is up while raising the hilt to your forehead. Simultaneously rotate the left hip back and the right hip forward. This is a _right parry_. Let the tip of the bokken drop and continue around behind you in a circular motion as you step forward with the left foot and perform a shomen cut. Rotate the blade counterclockwise until the edge is up while raising the hilt to your forehead. Simultaneously rotate the right hip back and the left hip forward. Your arms should end up in a crossed position. This is a _left parry_. Let the tip of the bokken drop and continue around behind you in a circular motion as you step forward with the right foot and perform a shomen cut. Alternate left and right in this way, moving across the floor. This suburi is the same as number 5, with one addition; in between each cut and parry shuffle forward slightly and perform a _tsuki_ on that side. 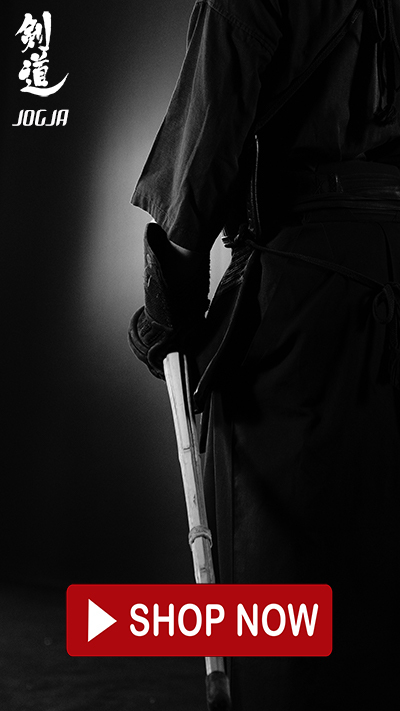 A tsuki on any side is a thrust to the midsection with the tip of the bokken. Shuffle forward slightly with the front foot and turn the blade so that it faces the opposite side from the front foot, e.g., a right tsuki has the right foot forward and the blade facing left. Again, alternate left and right in this way, moving across the floor. This suburi starts from the ready position with a right shomen cut. Move forward with the left foot and perform a left tsuki. Perform a left parry and step forward with the right foot int a right shomen cut. Repeat, moving across the floor.